Background created on a piece of natural ice and modified the color digitally. Image: Peas of Mind, Kidfresh, Yummy Spoonfuls, Jose A. Bernat Bacete/Getty Images. Design: Kenzie Mastroe/SheKnows. It’s the end of the day, and you’re exhausted. But the tiny tummies in your household beg to be filled, so you know your work isn’t done. Still, you’ve got options, right? Some days you simply can’t imagine standing in front of the stove for an hour to prepare dinner, and you don’t have to. We’re not saying it should be your standby, but the occasional healthy frozen kids meal can definitely save your sanity in a pinch. 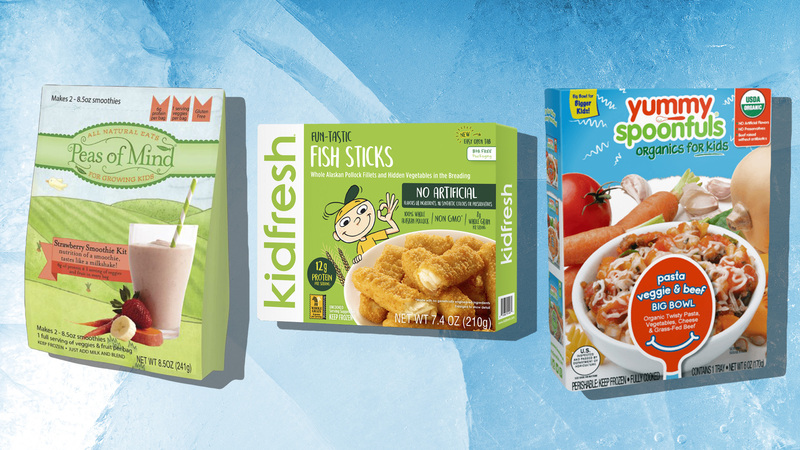 We know what you’re thinking: Isn’t “healthy frozen kids meal” an oxymoron? And, sure, you have a point. Frozen dinners aren’t exactly known for being the most nutritious of fare. 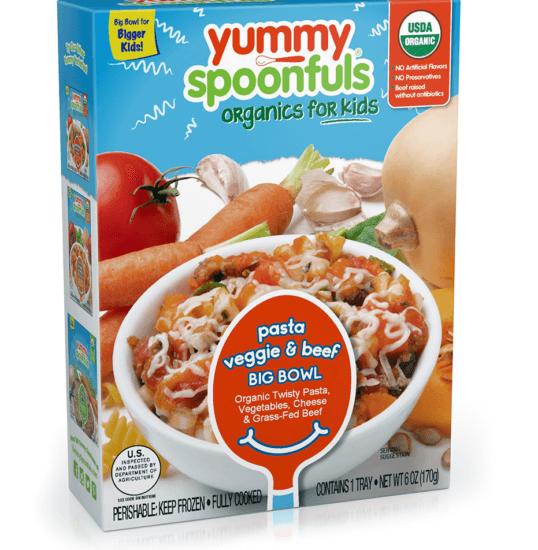 However, more and more, food companies are starting to explore freezer-friendly menu options mamas (and daddies too!) can feel good about feeding their little ones. In fact, some frozen kids meals on the market today are healthier and more affordable than takeout. We did a little digging to find 10 stellar options to consider the next night you need something quick, easy and nutritious to serve your family. 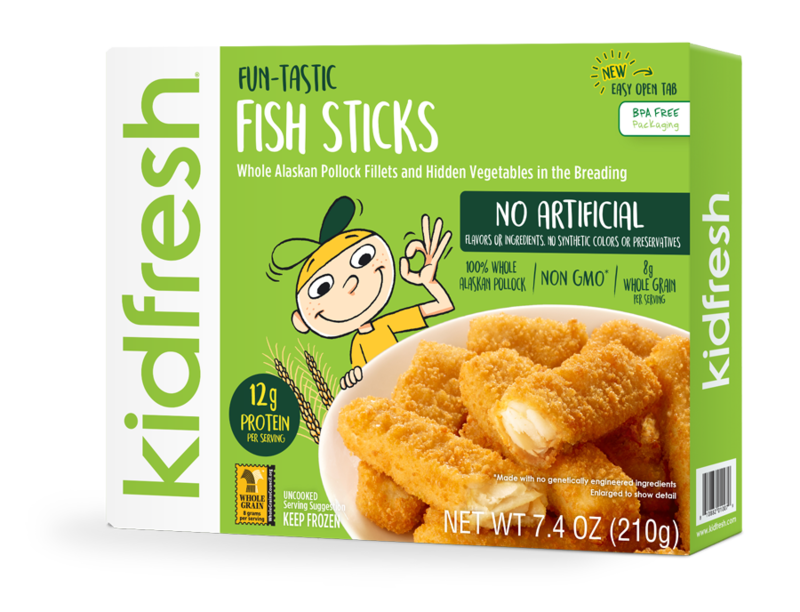 Here’s the truth: Kids can tear up some fish sticks! But unfortunately, most freezer-aisle fish sticks are chock-full of preservatives and fatty fried breading. Therein lies the brilliance of Kidfresh’s Fun-tastic version, which features whole Alaskan pollock fillets with veggies hidden in the breading. Did we mention there are no artificial colors, preservatives or ingredients? OK, you caught us. This isn’t technically made for kids. However, we found a dearth of frozen pizza options considering how popular this particular dish is with little ones. So, before you resort to feeding your kid one of those questionably soggy Kid Cuisine pizzas, consider Caulipower’s Margherita instead. 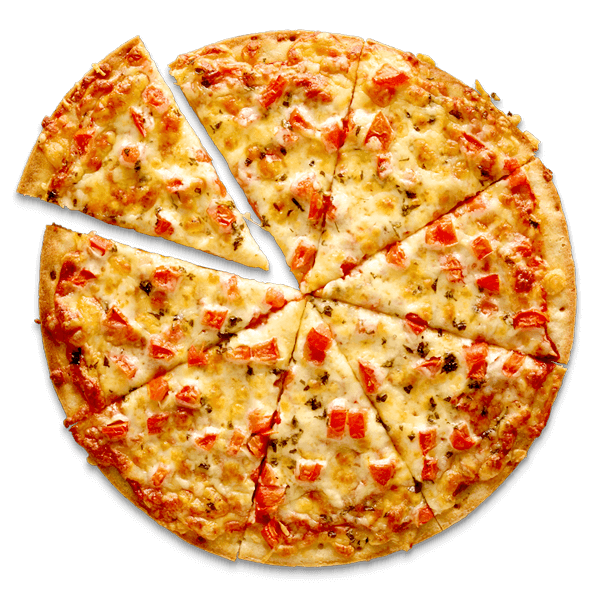 Half the pie is only 330 calories, and it contains less than half the sugar of leading gluten-free pizzas. Smoothies are a busy mom or dad’s best friend because they’re a healthy and quick meal option. 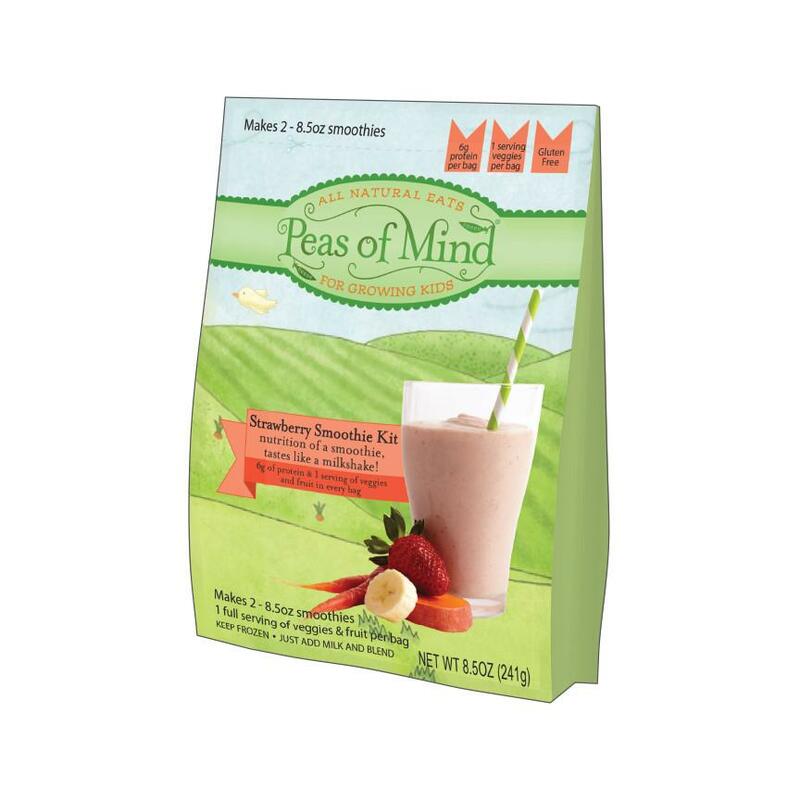 Peas of Mind’s Strawberry Smoothie Kit just requires milk to make two shakes complete with one full serving of veggies and fruit. They taste like milkshakes, so your kids will think you’re the coolest, and their 9 grams of protein per smoothie will make you agree with ’em. Matthew McConaughey’s wife Camila Alves brings us affordable, health-conscious frozen kids meals through Yummy Spoonfuls, an organic food brand she co-owns with founder and nutrition expert Agatha Achindu. Dishes like this pasta, veggie and beef bowl boast all the appeal of highly caloric offerings from, say, Chef Boyardee, but are filled with mom-friendly ingredients like vegetables and grass-fed beef. 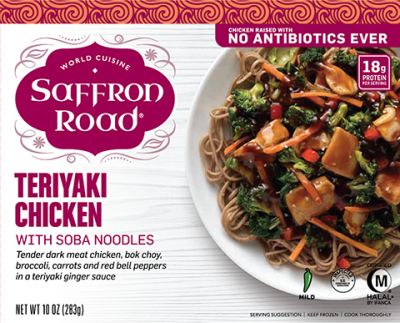 True, Saffron Road’s Teriyaki Chicken with Soba Noodles doesn’t say “for kids” on the box. But we’ve never met a kid who doesn’t love soba noodles — or teriyaki anything for that matter. And let’s be honest. Every tired parent caves to a Chinese food takeout craving once in a while. This frozen version packs a nutrient-dense punch with bok choy, broccoli, carrots, bell peppers and antibiotic-free chicken. 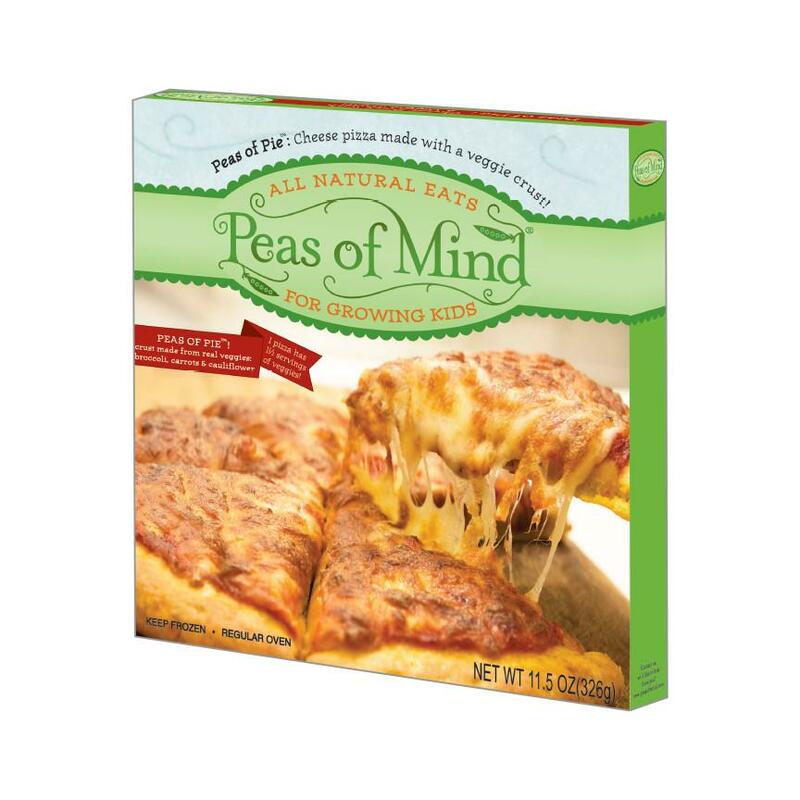 If you don’t need a large pizza, Peas of Mind’s personal-size cheese pie is just the ticket for the tiny tummies in your household. Egg-free, soy-free and nut-free, it features an ingenious crust with real broccoli and carrots kneaded right into the dough. Why didn’t we think of that?! 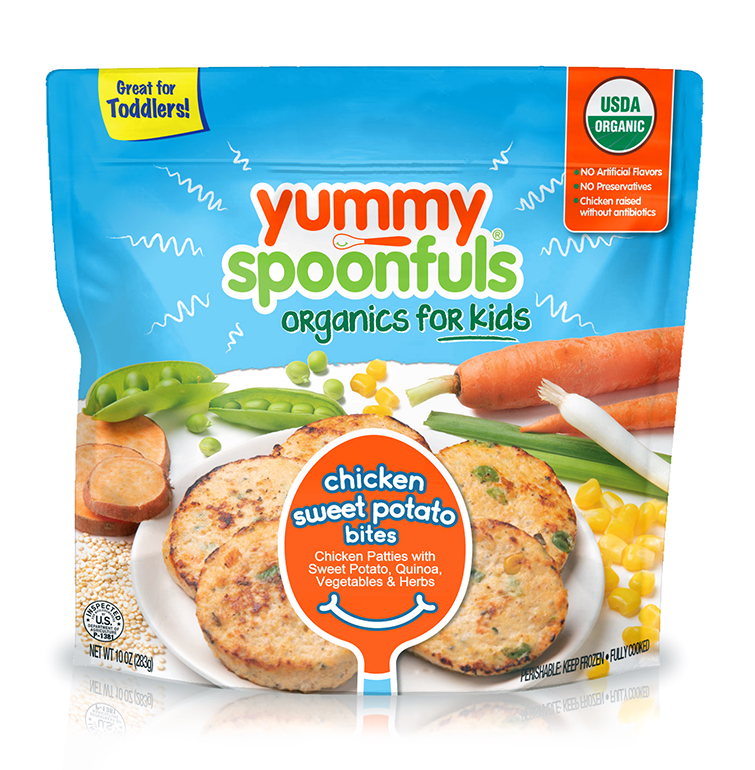 As is the Yummy Spoonfuls way, these Chicken Sweet Potato Bites contain no preservatives, added sugars, additives or fillers. They’re made with real food, so they’re always organic and non-GMO. And if you still need convincing, just consider the fact that they’re filled with ground chicken, sweet potato, whole-grain quinoa and fresh herbs. 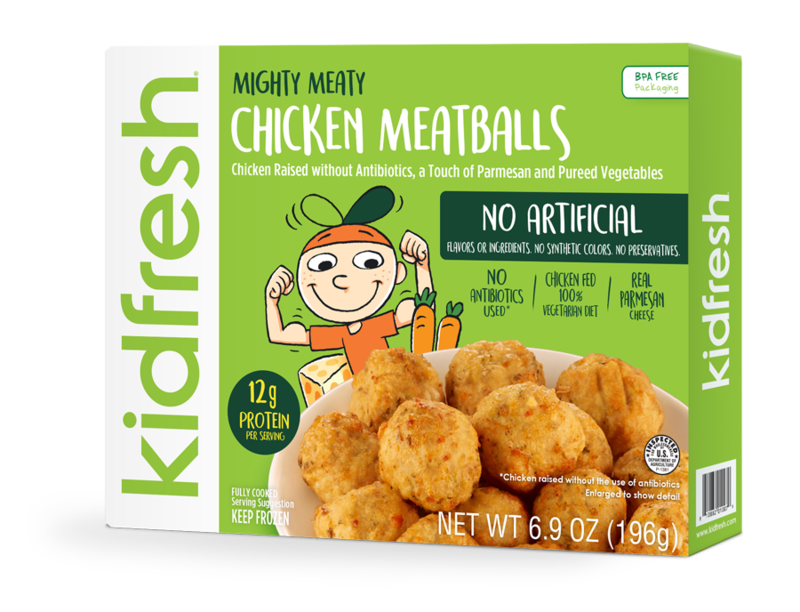 If you want to talk about a total kid-crowd-pleaser, the topic of conversation should be Kidfresh’s Chicken Meatballs. What kid doesn’t think meatballs are the most fun food? You’ll feel good about feeding them these, which boast antibiotic-free chicken, onions, celery, shredded carrots and wheat flour breadcrumbs. 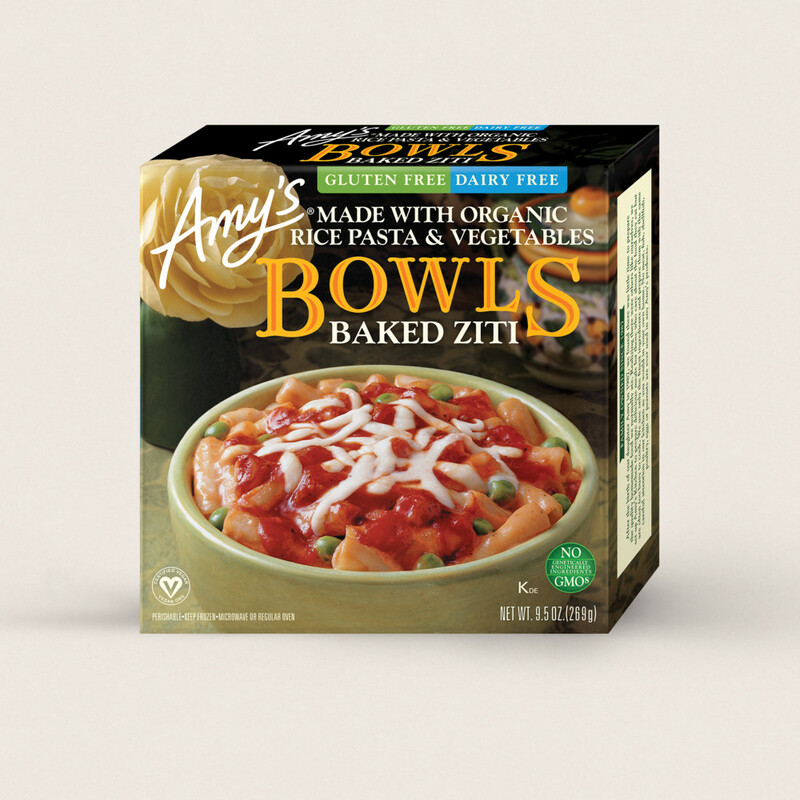 Interestingly, Amy’s used to market their baked ziti bowls to kids (seriously, it said, “kids,” right on the box!). No word on why the packaging changed, but it doesn’t change the fact that this dish is still a win when it comes to feeding your kid a healthy frozen meal. Made with rice pasta, organic peas and dairy-free cheeses, it’s especially perfect for little ones with lactose intolerance. Any parent who’s ever dealt with a picky eater knows the secret to stress-free mealtimes: mac n’ cheese. Kids don’t complain when you put a bowl of cheesy goodness down in front of them. However, you also want to know that if you need to resort to this classic comfort food on a regular basis, it’s at least a little healthy. 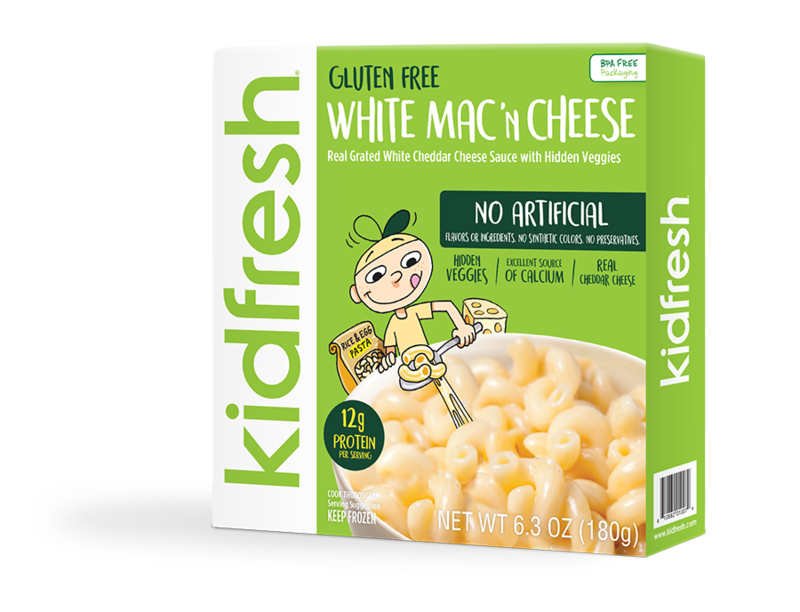 Well, say hello to Kidfresh’s White Mac ‘N Cheese. Its white cheddar sauce ensures kids get that classic taste while the hidden veggies in the sauce give you peace of mind where nutrition is concerned. Plus, it’s gluten-free.